The Buccaneers make up all of a 21-point deficit but lose on Randy Bullock’s 44-yard field goal on the final play of the game. The day began with a report that DeSean Jackson wants to be traded. Then the Bucs went out and showed why you can’t blame him. 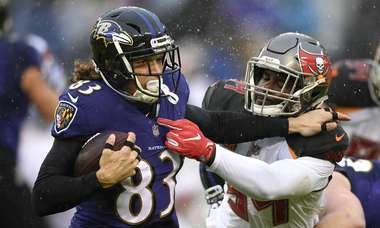 Jameis Winston threw four interceptions, including one that safety Jessie Bates returned 21 yards for a touchdown, in the Bucs' 37-34 loss to the Bengals. Winston was benched after his fourth interception and replaced by Ryan Fitzpatrick, who brought the Bucs all the way back. Roughing the snapper penalty on the Bucs is declined, and the Bengals win, 37-34. The kick is good, but there is a flag on the field. Randy Bullock out to try a 44-yard field goal. Dalton hits Green again for 10 yards to the 30. :06 left. Delay of game on Adarius Taylor gives the Bengals 5 more yards. Dalton finds A.J. Green to the Bucs 40 with 17 seconds remaining. Bengals have a first down at their 35. I’m so lit right now! FITZMAGIC!!! Lol what a comeback!!! Shovel pass to Chris Godwin ties the game! 34-34 with 1:05 to play. Oh, my! Fizpatrick connects with O.J. Howard for an 18-yard touchdown. Now, the Bucs will try for 2. Fitzpatrick throws out of bounds, making it 4th-and-3. Fitzpatrick tackled at the 18, and it’s 3rd-and-3. The Buccaneers are at 558 net yards of offense. The team single-game record is 573. Notably, there are 18 remaining yards between the current line of scrimmage and the end zone. Let's get it! Fitzpatrick throws underneath to Jacquizz Rodgers, who spins his way to the 25. Fitzpatrick throws incomplete, narrowly avoids an interception. Fitzpatrick to Humphries to the Bengals 35. Mike Evans injured on the play. 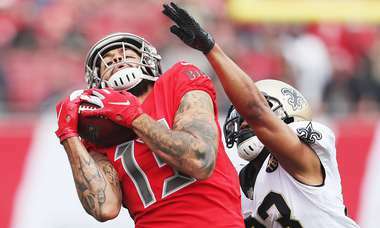 Mike Evans makes a 27-yard catch with William Jackson all over him, moving the ball to the Bucs 48. Pass is behind Chris Godwin, and it’s 3rd-and-1. Fitzpatrick finds Jacquizz Rodgers for 9 yards to the Bucs 21. Humphries makes a fair catch at the Bucs 12, with 3:16 to play. Dalton throws underneath for Mixon, but the running back drops the ball, and the Bengals will punt. Jason Pierre-Paul’s second sack of the game pushes the Bengals back to the 39. It’s now 3rd-and-16. Dalton hits A.J. Green down the left sideline for a first down at the Bucs 33. Joe Mixon escapes a tackle and finds some running room out to the Bucs 48. Mark Walton surges ahead for a Bengals first down. Dalton’s pass to tight end Matt Lengel is a yard short of the first down. #Bucs will punt from their own 21 with 6:43 left down 34-26. Fitzpatrick throws to DeSean Jackson short of the first-down marker, and Bucs will have to punt. Bucs force another Bengals punt. Jason Pierre-Paul with a sack! Just like old times. Fitzpatrick hits Mike Evans for a 72-yard touchdown, and it’s 34-26 Bengals with 9:57 to play. Catanzaro’s field goal kick makes it 34-19 Bengals with 12:54 remaining. Ryan Fitzpatrick scrambles for 18 yards on 3rd-and-21. Fitzpatrick connects with Chris Godwin for a first down at the Bengals 27. Peyton Barber rushes 16 yards to the Bengals 46. Fitzpatrick drops a snap, but picks up the ball and fires a dart to Mike Evans for a first down. Ryan Fitzpatrick replaces Jameis Winston at quarterback. Ugh. Winston picked off for the fourth time, and this one is costly, as Jessie Bates returns it 21 yards for a touchdown. Bengals lead, 34-16, with 2:10 left in the third. Bucs stop Joe Mixon on 3rd-and-2, so the Bucs will get the ball right back. Winston had 11 INTs in 13 games last season. This is just his fourth game. I'll take "spurious correlations" for $200, Alex. Again? Yes, again. Winston waaaay overthrows Cameron Brate, and linebacker Jordan Evans grabs the ball for the Bengals' third interception of the game. Barber picks up the first down on 3rd-and-1. Peyton Barber pushes the ball out near midfield. Dre Kirkpatrick doubtful to return for the Bengals with an Achilles injury. Winston tucks the ball and scrambles for a first down on 3rd-and-7. #Bucs defense gets a badly needed 3 and out. Andrew Adams breaks up Dalton’s third-down pass, and the Bengals will have to punt. Touchdown, Bucs! 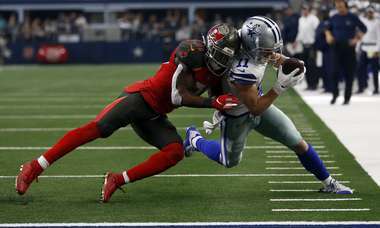 Peyton Barber leaps into the end zone, narrowing Tampa Bay’s deficit to 27-16. The call is overturned, so the Bucs have a first down at the Bengals 1. Winston throws to Adam Humphries at the just outside the 10, and Humphries appears to power his way into the end zone. Winston scrambles for 3 yards to the 17. Winston hits O.J. Howard for 20 more yards to the 20. Wow! A leaping Adam Humphries pulls in a Winston pass for 15 yards to the Bengals 40. Winston hits Justin Watson at the 45. It’s now 3rd-and-13. Winston sacked inside the Bucs 40. Pass interference call against Dre Kirkpatrick gives the Bucs a first down at their 48. Peyton Barber run nullified by holding penalty, setting up 2nd-and-20. Winston throws deep for DeSean Jackson, but the pass is incomplete. Cameron Brate with a reception out to the Bucs 42. DeSean Jackson may want to be traded, but the Bucs aren’t going to oblige. At least that's what you can draw from the comments by Bucs general manager Jason Licht when asked about an NFL Network report Sunday that Jackson had asked for a trade. Speaking on the Bucs radio network before Sunday’s game at Cincinnati, Licht did not address whether Jackson had indeed asked for a trade. But it doesn’t sound like one will happen. Catanzaro good from 25 yards, and the Bucs pull to within 27-9 with :03 left in the half. Winston overthrows Evans in the end zone, and it’s 4th-and-goal. Winston finds Humphries down to the 8. Winston makes good on his second throw to Evans, and the Bucs have 29 yards and a first down at the Bengals 18. Winston over throws Mike Evans, and Bucs face third down. Winston throws over the middle for Adam Humphries and is nearly intercepted again. Ugh. Dalton hits A.J. Green, who goes up and over Carlton Davis, for a Bengals touchdown. Extra point is missed, making it 27-6 Bengals with 2:34 left in the half. #Bengals Joe Mixon with 114 yards on 14 carries with 2:38 remaining in the first half. Uh-oh. Joe Mixon gets loose and rumbles all the way to the Bucs 17. Wow. Lot to unpack. DeSean Jackson with a 60-yard TD catch from Jameis Winston. Trade talk quiets. But Chandler Catanzaro missed the PAT and probably won't be kicking next week if this keeps up. Bengals 21-6. And ... here we go again. Chandler Catanzaro misses the extra-point try, and Bucs trail 21-6. That's a record-setting catch for DeSean, his 24th career score of 60 or more yards. That's a new NFL record. There you go! Winston hits DeSean Jackson in stride, and he races into the end zone for a 60-yard touchdown. Hubbard penalized for a late hit on a sliding Winston, and the Bucs have a first down at their 40. The #Bucs have come back from a deficit of 21 points or more once in team history: Nov. 2, 2008 vs. the #Chiefs. Won 30-27. And there’s Mixon again. 8 yards untouched and another Bengals touchdown. Cincy leads 21-0 with 5:07 left in the second. Dalton hits Tyler Boyd for 26 yards to the Bucs 8. Joe Mixon carries down to the Bucs 35. Winston sacked by Sam Hubbard, and the Bucs will be forced to punt. Ronald Jones tackled behind the line of scrimmage, setting up 3rd-and-14. Winston overthrows an open Chris Godwin. The Bengals convert the Winston interception into points as Dalton hits Boyd in the back of the end zone for a 14-0 lead with 10:04 to play in the second. Mixon takes a pitch around left end for 13 yards to the Bucs 13. Dalton hits A.J. Green for the first down. Bengals going for it on 4th-and-3 from the Bucs 36. Dalton scrambles for a first down to the Bucs 30, but it’s nullified by a holding penalty. It's not likely to happen, but what part of Dirk Koetter wants to make a change at QB and go to Ryan Fitzpatrick if this continues? Seriously? Winston with an awful throw that’s picked off by the Bengals' Preston Brown. Winston with a laser to Mike Evans, who takes the ball to the Bengals 27. Peyton Barber gets the carry on 3rd-and-2 and is stopped close to the first-down marker. After a measurement, it’s a Bucs first down. Bucs on the move, as Winston hits O.J. Howard for 18 yards out to the Bucs 43. Mixon bulls in from the 1, and Cincy is on the board first. Bengals lead 7-0, with 3:04 remaining in the first. And another deep strike. Dalton to Tyler Boyd, and the Bengals are at the 1. And ... that’s how you throw a deep ball. Dalton hits Jordan Franks in stride for a gain of 32. Winston — what else? — throws well over DeSean Jackson’s head. Bucs will have to punt. What would have been a first-down throw to Mike Evans is nullified by a false-start penalty on Ali Marpet. Brings up 3rd-and-8. Dalton hit as he throws on 3rd-and-12, and the pass falls incomplete. Bucs will get the ball right back. Jameis was gonna keep throwing picks until the #bengals held onto one. Really high and bad pass by Winston to an open Mike Evans is intercepted in the end zone by Bengals S Shawn Williams. Winston's pass is complete... TO @36SLY36! Ugh. Winston overthrows Mike Evans, and Shawn Williams intercepts the ball in the end zone. Check-down pass to Adam Humphries moves the ball to the 22, and another first down. Winston scrambles 6 yards to the 32 for a first down. Bucs going for it on 4th-and-4 from the Bengals 38. Winston floats a pass for Adam Humphries on 3rd-and-4, and it’s nearly picked off by Shawn Williams. Jameis Winston connects with Mike Evans for 19 yards and a first down to the Bengals 44. Barber picks up the first down and more, finally brought down at the 37. Peyton Barber rips off a 9-yard gain to the Bucs 29. Mixon stopped twice on runs up the middle, the second time by Jordan Whitehead, and the Bucs will take over on downs. Neutral-zone infraction on Jason Pierre-Paul moves the Bengals five yards closer. Now 3rd-and-3. Dalton’s pass for tight end C.J. Uzomah goes incomplete, bringing up 3rd-and-8. Andy Dalton hits Tyler Boyd for a 22-yard gain to the Bucs 29. Boyd is down on the play. Oh, boy. Joe Mixon bursts up the middle for 18 yards on the opening play from scrimmage. Minter and Bullough playing on special teams on the kickoff. #Bucs #TBvsCIN #Bengals #Buccaneers. Our Bucs gear is ready to go!